The United Arab Emirates located on the Persian Gulf in the Middle East, sometimes called the Emirates or the UAE, has a population of 9.2 million people (1.4 million Emirati citizens and 7.8 million expatriates). The country is comprised of a federation of seven states called emirates that were established in 1971: Abu Dhabi (which serves as the capital), Ajman, Dubai, Fujairah, Ras al-Khaimah, Sharjah, and Umm al-Quwain. Each is governed by a monarchy. Islam is the official religion and Arabic the official language. However, English is the language of education and business; Indian dialects are widely spoken as well. The UAE is a conservative country, however it is characterized as being more liberal than the other Gulf countries. The climate is hot and sunny from April to November, but air-conditioning is common and inexpensive. The winter weather is reasonably pleasant with temperatures of 15-25C. There are many popular physical activities like beach outings, desert dunes’ rides, boat trips in the mangroves, and hiking. There is a unique mix of Arab and Bedouin culture from historical markets, heritage villages and forts, mosques, and historical museums mixed with luxurious shopping malls, world class architecture, numerous amusement parks, film festivals, orchestras, fine art fairs, etc. The nightlife is active to include bars, dance clubs, beach clubs, and restaurants in many of the fancy hotels. The year round sunny, warm weather affords plenty of unique travel opportunities. The great teaching salary and benefit packages attract one of the most sought-after locations for teaching abroad. The huge numbers of expatriates and businesses from abroad investing in the UAE explain the high demand for ESL teachers. Teachers receive a travel allowance. The airports in Abu Dhabi and Dubai have great international connections and relatively inexpensive flights to the rest of the Arab world, Southeast Asia, Europe, and Africa. The UAE is very international and foreign-friendly. There is little to no crime. There are many social events and groups to join. The standard of housing is very good. Western brands and products are easy to find. Sporting events are abundant with ample beaches and swimming pools and the Formula 1, golf, tennis, and cricket championships. International recording stars routinely include the UAE in their tour. Commuting expenses for teachers are relatively low; many teachers lease cars or buy affordable secondhand cars. Taxis are used often and are inexpensive as well. Generally, free housing is offered to teachers, the size of the apartment dependent on the teacher and other family members. Often the apartment is furnished, or if not, a furniture allowance is allowed as well as a relocation allowance to get your place set up. Internet is available. Depending on their lifestyle, teachers can save more than 50% of their monthly salaries. Generally, teachers are required to have a teaching certification and two years of teaching experience. Teaching jobs are competitive. Teachers in UAE make an average of $3,350-$5,500 a month, tax-free. Teaching contracts are typically 2-3 years in length with a bonus of one month’s salary offered each year of work. Flights, health insurance, and education allowance for dependents are additional benefits offered to teachers in the UAE. Saudi Arabia, a desert country covering 95% of the Arabian Peninsula with the Red Sea and Persian Gulf coastline, offers a fascinating introduction into Arabic and Islamic culture. The temperature is hot and dry with little rainfall. Interesting to note, there are no above ground rivers or lakes in Saudi Arabia. The country is known as the birthplace of Islam and characterized by sacred mosques in Medina and Mecca. The capital Riyadh is a large booming city with interesting museums and other attractions like the Kingdom Centre named Skyscraper of the Year, a three-floor retail mall. The cities of Jeddah and Dammam are more liberal. Traditional marketplaces throughout the country boast bargain prices and welcome haggling for carpets, jewelry, and decorating accessories. The resort cities offer an array of sports and recreation: snorkeling, diving, paragliding, scuba diving, fishing, horseback riding, and biking. You will also find plenty of beaches and beautiful coral reefs; usually the beaches are private and there is an entry fee of $20.00 or more. Movie cinemas are prohibited, but movies are readily available through the excellent local cable television services ranging from $65-$108/month. Labor costs are low for hired help (i.e., housekeeper, cook, gardener, maintenance worker, etc.). It is a great location for travels to other continents. Prices for groceries and restaurants can be 15% higher than in the U.S., yet there is great availability of food and an abundance of all of your favorite Western restaurants as well as an abundance of local cuisines to sample; expensive and luxurious things in other countries are more reasonable here; alcohol is prohibited, but there are juice bars. The price of automobile gas is very cheap (e.g., 40 cents a gallon) so taxi prices are very inexpensive; electricity is inexpensive, too, thus air conditioning is very cheap (e.g., running it all day may cost $30.00 a month). Winter is very mild, but the heat is over 100 degrees in May through September (however, there is little humidity). housing costs range from $200-300 for a studio monthly to $2,500 and more for a 3-bedroom house in a western compound. The salary earned is tax-free (although you may need to report your taxes made back in your home country); health care is provided; there are extra opportunities to tutor in the evenings that are quite lucrative thanks to government-sponsored initiatives encouraging all citizens to learn English as well as many Saudi students seeking to continue their higher education outside of the country. Teachers in Saudi Arabia typically make between $2,600-$4,000+ per month with a salary increase based on experience and qualifications. Saudi Arabia predominantly targets qualified and experienced teachers with a minimum of 2-5 years. Salaries are tax-free. Thus there is a great opportunity to save a lot of money and to pay off accumulated bills/loans. As one of the wealthiest countries in the Middle East, the cost of living is a bit higher than some other popular teaching destinations – although salary/benefits are proportionate. Other perks generally include airfare reimbursement, health insurance, and contract completion bonuses. The country supports education; classroom working conditions are good. Kuwait is a small, oil-rich Middle Eastern country surrounded by archaeological sites, large desert areas, and the Arabian Gulf shore. It is one of the most wealthy countries in the world. 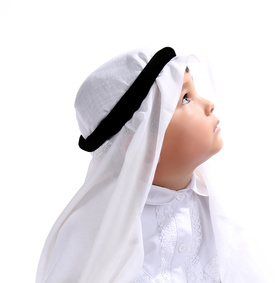 Arabic is the primary language used, although English is often spoken as well. Being a small country, the temperature is the same throughout the region ranging from 44 degrees Celsius (112.1 Fahrenheit) in the summers to 19 degrees Celsius (66 degrees Fahrenheit) in the winters. There is sunshine the year around. Because of the country’s size, there is only one large urban population area – the capital of Kuwait known as The City of Kuwait. 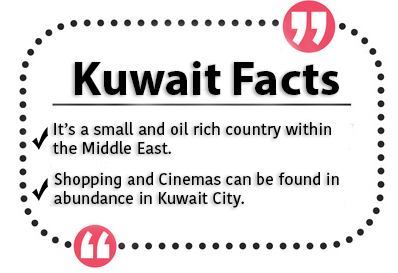 In The City of Kuwait, there are numerous fashion and shopping districts along with various restaurants and cinemas. Local markets offer spices, hand-crafted clothing, and artwork along with fresh produce and meat. The Grand Mosque in The City of Kuwait offers a close look at how Muslims worship and the sacred tradition of Islam, as the country is a predominantly a Muslim country. Women need to be cognizant of the dress code restriction: knees and shoulders need to be covered. In addition, there are several other differences in living conditions than living in the West: men outnumber women 2 to 1; liquor is prohibited. Most paid jobs are tax-free. A gallon of gas costs the equivalent of about $0.82. You can find anything you want at the shopping centers. Tutoring jobs are abundant and pay well as the demand for English is skyrocketing. The lifestyle is not as fast paced as the U.S. There are many Western groups to join for social and leisure clubs: golfing, scuba diving, horse riding, shisha, wine-lovers, pet lovers, gardening, music, soccer/football, etc. It is a user-friendly country where most people know English and treat foreigners with respect. There is a great diversity of countries living in the country so you will have many foreigners teaching alongside you. The typical requirements for people to teach in Kuwait include being a licensed teacher with at least 1-2 years of experience. Teachers with more experience are often offered leadership positions as a department or faculty head. Many private schools ask that applicants have a foreign language (TEFL) certificate as well. Teachers are generally awarded a two year contract with a probationary period for 90 days. After successful teaching during this time period, the teacher qualifies for a Civil Identification card, granting permanent resident status which helps with signing residential lease agreements and opening bank accounts. The school structure in Kuwait is similar to the Western world in the grade levels, calendar year, vacations, etc. Class size is approximately 20-25 students. The average teacher salary is about $28,000 (can be more or less depending on your qualifications) annually which includes paid housing, healthcare, and annual flights home after the school year. The cost of living is similar to that of the U.S. and Canada. You will need a visitor’s visa to enter the country and a “iqama”, an additional visa based on a valid employment offer that the employer applies for on your behalf. 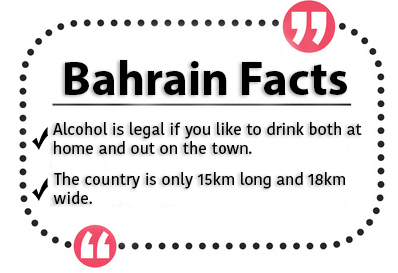 Bahrain is considered a socially liberal (alcohol is legal), friendly, wealthy Gulf country. The country has a tropical desert climate with hot, sunny days for the majority of the year. The summers can also be extremely humid. Water activities are popular, including sailing to many of the smaller islands surrounding the mainland. There are a variety of food selections from Western fast food to high-end restaurants to street stalls as well as a number of shopping malls and movie theaters. Bargain hunters can find crafts and souvenirs, jewelry, clothing, spices, fruit, and vegetables in the local markets (souks). Many foreigners choose to rent a car on a monthly basis; the road system is easy to navigate and quite efficient. After all, the mainland is only 15 km long and 18 km wide. English is widely spoken so the demand for English teachers is high. People are friendly and there are many opportunities to meet people from other cultures. It is relatively cheap to fly to neighboring countries for travel. The price of gas is cheap. Teaching contracts usually include an excellent salary package, accommodations, flight allowance, and health insurance. Teachers are generally required to have a valid teaching license and previous classroom teaching experience. With the great demand to learn English, teachers can find lucrative tutoring jobs in the evening in addition to their daytime teaching jobs. This affords the teachers to save money and to build up savings. In general, the working conditions in the schools are good, there is strong parent support, and students value education. Oman, the fastest growing country on the Arabian Peninsula, has long coastlines on the Persian (Arabian) Gulf, Arabian Sea, and the Gulf of Oman. Its size is that of the UK with a population of 2.2 million. Inflation rate is only about 1%. Its climate is hot and dry with the land’s vast desert region and mountains. 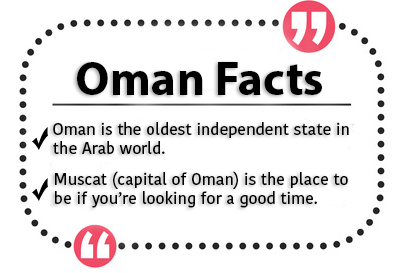 Oman is the oldest independent state in the Arab world. Trips to the beach and desert camping are fun things to do. Visiting the many historical forts and shopping at traditional markets round out typical experiences. Muscat, the largest city in the country, is the capital of Oman and home to many landmarks including the famous Sultan Qaboos Grand Mosque, the Oman National Museum, a new opera house, the old waterfront Muttrah quarter, a busy fish market, outdoor markets, and the Grand Mall (the largest mall in Oman). All the major hotels in Muscat have live bands and full range restaurants. Wahiba Sands, a region of dunes inhabited by Bedouins, is a small desert located just a few hours from the capital. Here, you can take a dune ride or camp out under the stars. Another popular place to visit is Masirah Island, a desert island mostly comprised of deserted, pristine beaches devoid of tourist attractions and shopping centers. Sunbathing, snorkeling, and swimming are popular. Snake Gorge is a canyon off of the Wadi Bani Awf, descended by jumping off cliffs into plunge pools and sliding down natural flumes. There is widespread demand for private English tutoring in Oman as all Omani schools teach ESL and it is spoken in most hospitals, airports, and hotels. You will meet many teachers from other countries as ESL teachers in Oman usually come from Egypt, Syria, and Jordan. Teacher salaries are twice the cost of living so you can save a great deal of money. Classrooms and residences are air conditioned. The students in general are highly motivated and fun to teach; independent thinking and autonomous learning skills are embedded in the curriculum. The contrast in the country is unique: peaceful, quiet places and bustling, modern urban areas. You can live quite cheaply. Oman is a rewarding place to teach and has all the advantages of a vibrant and fascinating culture and dignified, friendly people. Teachers in Oman usually make between $2,000-$3,500 per month, tax-free. Typically, teaching jobs include furnished accommodations, airfare, medical insurance, paid vacation time, and allowances for tuition and transportation for dependents. Most teaching jobs in Oman have a contract duration of 2 years. Teachers are required to have a minimum of a degree, 2 years of teaching experience, and often a TEFL certificate. Additionally, there are many opportunities for ESL tutoring as native English speakers are somewhat rare. The weather can be very hot and humid in the summer to pleasantly warm sunny days in winter. There is a lot to do for everyone’s lifestyle whether dune bashing or desert camping, assorted water sports/activities, yoga, theater, live music or joining any number of assorted social/fitness groups. Most residents choose to rent or buy a car, or they take taxis as there is a lack of public transportation. The country is one of the safest places in the world. Many international people reside in this country, one of the wealthiest in the world. The country is very modern and prosperous. Teaching in Qatar allows you opportunities to experience the ancient sights and traditions of the Ottoman period alongside modern shopping malls and museums. The beautiful beaches and year round sunshine are wonderful. Schools typically begin early (6:30-7:00 a.m.) to avoid the heat of the afternoon. You can find traditional Arab foods, lots of fresh seafood, and fresh fruits. 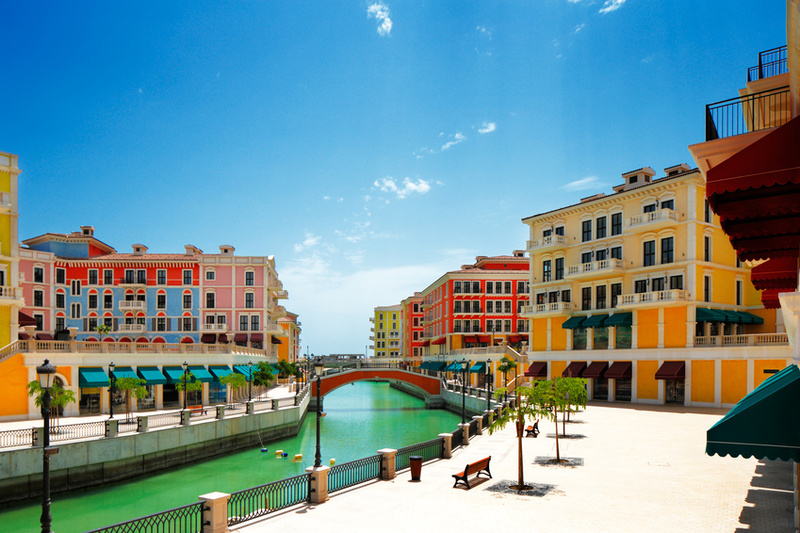 The country is very international; numerous expats and foreign workers reside in Qatar. With a $1,000-$2,000 average cost of living/month, teachers can expect to save a great deal of their earned income and/or use it for travel. You can travel easily to other countries. Teachers in Qatar can work in some of the top schools in the world while earning a competitive salary ranging from $2,400-$3,700 tax-free. The work week begins on Sunday and ends on Thursday with Fridays and Saturdays off. Teachers assuming leadership roles often are awarded a higher salary based on experience and qualifications. A BA/BS degree is required with a MA preferred. TEFL certification is a desirable qualification, especially since teaching jobs are very competitive in this small country. 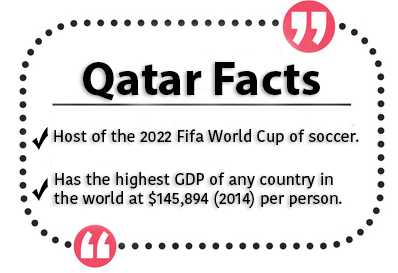 Other perks of teaching in Qatar include flight, accommodations, utilities, and health insurance. Some positions also award start-up costs of approximately $1,500 and benefits to family members, for example their education. Schools sponsor the work visas for foreign English teachers. Teachers from South Africa, New Zealand, Australia, Ireland, the UK, Canada, and the U.S. are highly preferred. The students are enthusiastic and motivated to learn; the standard of teaching is high.